Tavern on the Hill just might boast the finest views in Ottawa. 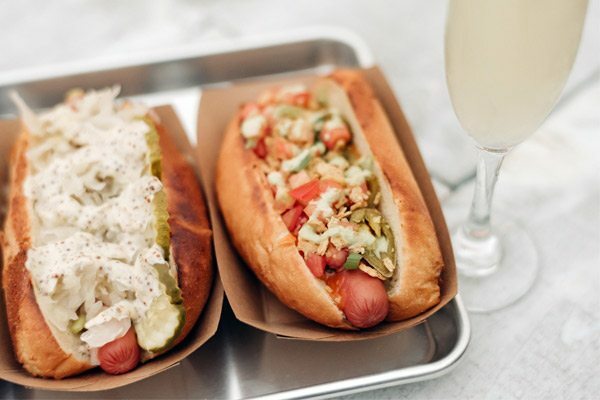 Nestled at the bottom of Major’s Hill Park, the new gourmet hot dog restaurant/bar offers a huge terrace with sofas, bistro tables, and chairs, as well as vistas to die for. A glance to your right will bring you face-to-face with the glass atrium of the National Gallery of Canada and the Astrolab, while to your left and straight ahead you’ll get an eyeful of the Chateau Laurier, the Houses of Parliament and the majestic Ottawa River, sparkling and stretching towards Victoria Island. 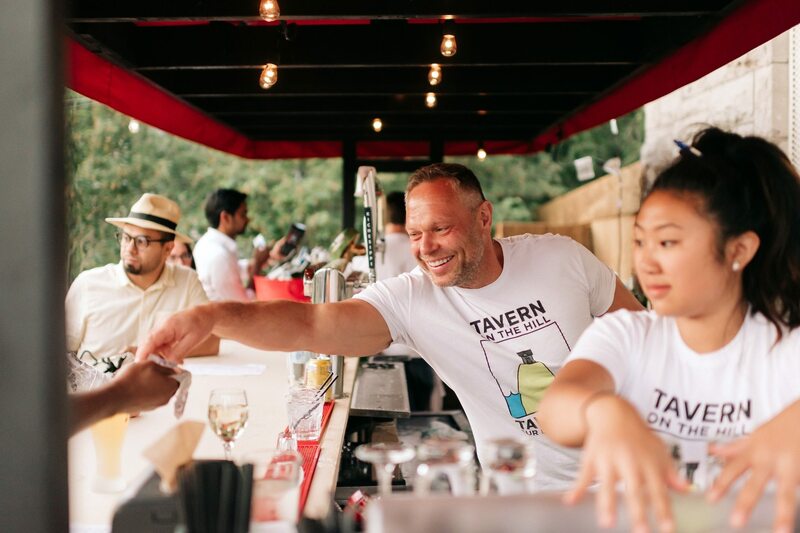 The Tavern occupies the tiny heritage stone building formerly known as Blink Gallery and is the brainchild of Andre and Chantal Schad, owners of the eponymous boutique on nearby Sussex Drive and the shoe store, Wolf and Zed. Andre Schad behind the bar at the new Tavern on the Hill. Photo by Ben Welland. Why would a pair of fashion entrepreneurs decide to jump deep into the restaurant business? Andre: I was actually in the restaurant business way back when with a bar called Schadillac Saloon on Murray Street. But to answer your question, why now? Largely because we have a good relationship with the NCC, our landlords on Sussex Drive, and they like what we’ve done with the buildings there. So they offered us this opportunity. How did you come up with the concept for hot dogs and champagne? The two don’t usually go together. Chantal: It was Chef Matt Carmichael (Riviera, Datsun, El Camino) who pointed us in the direction of Bubbledogs, in Bloomsbury, London. So we’ve adapted that idea and there will be a full bar, but also plenty of choice for bubbles from Prosecco to Cava and Champagne. Andre: We are keeping it very simple, as it’s a small space. Inside we will be selling grab-and-go salads, ice cream bars, and scooped cones, popsicles, penny candies, sunglasses, hats and Happiness is … Canada t-shirts, which are flying out the door at Schad. Outside, we will have a full hot dog menu. It’s self-service. You order at the window and pick it up when your name is called, to keep it super-casual. Chantal: Hot dogs are a chicken-pork blend (also a vegetarian option) served in an artisan bun and will come fully dressed. We’ve got The Texan, The Italian, The Greek, The Vietnamese, The Mexican, The Quebecois (with curds and gravy), The German, and The Korean with kimchi made by a local friend. Salads will include incredible tabouli and also hummus and baba ganoush made by Christine Khourani. We’ll also be doing a charcuterie plate – a demi-baguette, cold cuts, and cheese. What’s the vibe you’re after? Andre: We are really hoping to create that relaxed European family atmosphere. If you’ve travelled in Europe you’ll know that it’s perfectly possible for adults and children to have a great evening simultaneously. At Tavern on the Hill we want children to love their hot dogs and play happily in this gorgeous space, while their parents can enjoy a glass or two of champagne, wine, or a beer long into the summer nights. We will also be offering live music. How long do you intend to be open? Andre: Our opening hours will be 11 a.m. to 2 a.m. weekdays, 9 a.m. to 2 a.m. on weekends. We’re hoping to remain open to Halloween if the snow doesn’t fly.